ZL Engineering Plastics Unveils New Stock Shape Manufacturing Facility In Lenexa, Kan.
New Extrusion Capability is First Phase of Strategic Growth Plan in North America. 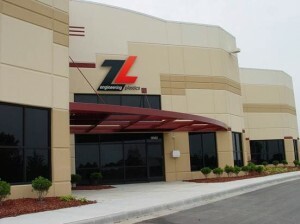 LENEXA, Kan., September 4, 2012 – ZL Engineering Plastics Inc., a leading manufacturer of high-quality thermoplastic stock shapes, has started up a new extrusion facility at its Lenexa, Kan., site in response to growing North American demand for its extensive range of stock shape products. The new production capability is the first phase of a strategic plan to grow the stock shape business in North America. Previously, stock shapes were manufactured in Kaprun, Austria, by ZL Engineering Plastics’ parent company, Zell-Metall GmbH Engineering Plastics. ZL Engineering Plastics has enjoyed strong growth over the last several years by providing high-quality materials and superior customer service, according to Giesen. The company manufactures sheet, rod, and tube made of a range of engineering thermoplastics including nylon, acetal, polyethylene terephthalate (PET), polyetherimide (PEI), and polyetheretherketone (PEEK). These materials meet the demanding requirements of fast-growing end-use markets including aerospace, medical, automotive, semiconductor, agriculture, food processing, and construction. Stock shapes made of engineering plastics are machined for numerous applications that replace alloys and other competing plastics. Typically, these stock shape materials offer lighter weight, corrosion resistance, reduced noise, and longer part life. ZL Engineering Plastics expects to expand its product offering and add new capacity as customer demand dictates in North America, according to Giesen. About ZL Engineering Plastics Inc. ZL Engineering Plastics Inc., based in Lenexa, Kan., is a leading manufacturer of stock shape products made of engineering plastics including acetal, PET, nylon, PEEK, and PEI. These products, which are produced in sheet, rod, and tube stock shapes, are machined for use in a broad range of demanding applications in the aerospace, food processing, automotive, medical, agriculture, and construction industries. ZL Engineering Plastics is a subsidiary of Zell-Metall GmbH Engineering Plastics in Kasprun, Austria, which is a unit of the Klepsch Group. It operates warehouses and service centers in Lenexa, Kan., and Buena Park, Calif.